FEATURE: Cuckoos flying high, but can Fenman, Tigers or Clarets clip their wings? Yaxley players celebrate their winning goal at Deeping Rangers. Photo: Tim Wilson. It’s the most exciting United Counties League Premier Division title race for years with five top teams battling it for the main prize. Four of them, current leaders Yaxley, Wisbech Town, Deeping Rangers and Holbeach United, are local with Newport Pagnell carrying the flag for the outsiders. Action from Holbeach United's 4-0 win at Peterborough Northern Star (stripes) on Tuesday. Photo: Chantelle McDonald. @cmcdphototos. 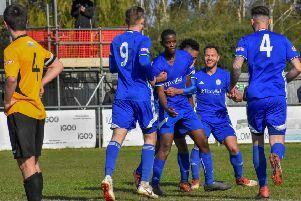 Here, Peterborough Telegraph non-league football writer ALAN SWANN looks at the run-in of the main contenders and predicts who will emerge victorious. Remarkably if ninth place Leicester Nirvana won all their remaining games they would be crowned champions. They are currently 23 points behind leaders Yaxley with nine games in hand), but their run-in is so tough, they’ve been left out of this feature. Summary: They could easily go unbeaten for the rest of the season, but they might have to win every game to finish top. And that will be tough. Summary: The games at Wisbech and Holbeach will be crucial, but Pagnell lost at lowly Sleaford last Saturday and that is a concern. Summary: The Fenmen will have to be near faultless for the rest of the campaign, but good judges tell me they have the best squad in the division. Summary: Some tough games still to come and they have an irritating habit of dropping points to weaker teams. Summary: Losing to Yaxley at home last Friday (March 9) was a big blow, but they have the quality to have a strong run at the title. Too many awkward games for me.